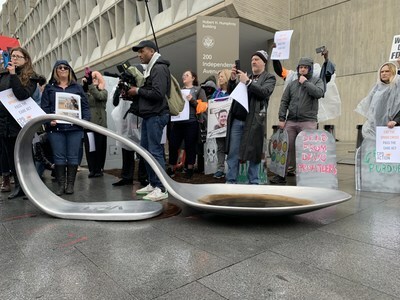 800-Pound Metal Heroin Spoon Dropped Outside HHS Building in D.C.
WASHINGTON, April 5, 2019 /PRNewswire/ -- Recovery Reform NOW, along with The Opioid Spoon Project (OSP), Prescription Addiction Intervention Now (P.A.I.N. 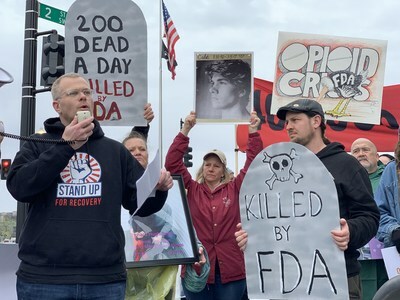 ), and Team Sharing, held an action today in front of the Department of Health and Human Services (HHS) in Washington, D.C. where they dropped an 800-pound metal spoon stamped with the logo of the Food and Drug Administration (FDA). The spoon, created by activist/artist Domenic Esposito of The Opioid Spoon Project, protests the FDA's recent approvals of new, exceptionally powerful opioid painkillers and lack of action in approving and bringing to market new innovative recovery medications. The Opioid Spoon Project dropped an 800-pound metal heroin spoon in front of the Department of Health and Human Services in Washington, DC during the Wake Up FDA action. Recovery activists including Ryan Hampton spoke at the Wake Up FDA action outside of the Department of Health and Human Services in Washington, DC. "The FDA's irresponsible actions in response to the opioid crisis are both inexplicable and dangerous," said Wake Up FDA spokesperson Ryan Hampton, recovery activist, founder of The Voices Project and author of American Fix: Inside the Opioid Addiction Crisis – and How to End It. "Defying recommendations from its own advisory board members and other experts, the FDA continues to approve dangerous opioids that will wind up diverted while limiting access to recovery medications that would fill gaps in care. We demand transparency and accountability, and we call on the FDA to address the opioid crisis with the urgency it deserves." Recovery Reform NOW, a policy watchdog organization that works to improve public policy on addiction and recovery, started the Wake Up FDA campaign in response to the FDA's recent approvals of powerful and dangerous opioids—such as the November 2018 approval of Dsuvia—against expert advice. Additionally, Wake Up FDA demands that more recovery medications to fill treatment gaps and keep people in long-term recovery be made available immediately. "Not only do we need to prevent more people from becoming addicted to opioids, but we need to make sure that people who are living with addiction have the resources they need to recover," said Team Sharing founder Cheryl Juaire. "On behalf of parents around the country who have lost a child to addiction, we call on the FDA to make available every possible recovery tool. It's a matter of life and death." In a public letter to President Trump and HHS Secretary Alex Azar, the campaign called on the administration to take FDA Commissioner Scott Gottlieb's resignation as an opportunity to shift the FDA's opioid crisis efforts to focus on recovery. Specifically, Wake Up FDA calls on President Trump and Secretary Azar to nominate a new commissioner who understands recovery and the FDA's role in addressing the public health impact of the opioid crisis. "We will continue to show up and hold everyone who is complicit in the opioid crisis accountable," said artist and activist Nan Goldin, founder of P.A.I.N. "We will continue to call out those who must do more to address this suffering. Today, it's the FDA. We will continue to put pressure on the FDA until they meet our demands." Over the last year, The Opioid Spoon Project has dropped off several 800-pound metal spoons at the locations of various parties who are culpable for the opioid crisis. "The spoon sculpture—engraved with the FDA's logo—signifies the responsibility the FDA bears in first causing and now fixing this urgent national health crisis," said Esposito, OSP founder. "We deliver customized spoon sculptures to show those responsible that the recovery community and the general public are watching and will not rest until everyone steps up and cooperates in ending this crisis." Learn more about the Wake Up FDA campaign at wakeupfda.org. Read the joint letter to President Trump and Secretary Azar from Wake Up FDA supporters here. Recovery Reform NOW is an organization dedicated to advocating and advancing policy reforms for the treatment of substance use disorder, from removing access barriers to the delivery of treatment, to stem the tide of the national addiction epidemic. Learn more about Recovery Reform NOW at https://www.recoveryreformnow.org/. P.A.I.N. (Prescription Addiction Intervention Now) was organized by world-renowned artist Nan Goldin to address the opioid crisis. We are artists, activists, and people dealing with addiction who employ direct action as a platform for our demands. We target the Sackler family, who manufactured and pushed Oxycontin, through the museums and universities that carry their name. We advocate for Medication Assisted Treatment and Safe Consumption Sites. Learn more at https://www.sacklerpain.org/. TEAM SHARING Inc. is a national organization of parents who have lost a child to Substance Use Disorder (SUD). Through social networking, community activism, grief services and advocacy, TEAM SHARING provides support and friendship to grieving families while working to raise awareness of Substance Use Disorder and its impact on our communities. Learn more at https://www.teamsharinginc.org/. The Opioid Spoon Project (OSP) is a nationally recognized artist- and activist-driven initiative that is committed to informing and educating the public about this unfolding tragedy and promoting awareness about the white-collar criminals whose greed and indifference brought it to life. Learn more at http://www.theopioidspoonproject.com/.